It's been four years since the first Fieldrunners, the hit tower defense game which was what everyone with an iPhone seemed to have long before Angry Birds took over. Subatomic Studios has finally created a sequel, a rather large game that makes the first one look like a tech demo. The core gameplay is the same in Fieldrunners 2. You drop towers in place to stop waves of onrushing enemies. As the enemies die, you make money, which you can then spend on more and better towers. That's how it is in most tower defense games and how it still is in Fieldrunners 2, though the game's creators have introduced more levels that have pre-set lanes, veering away from the open-field style that defined the original game's iconic main level. There is a lot of new stuff in this sequel, which both represents an evolution of the series and the fact that, these days, $3 on the iTunes store should get you a game with some heft. The heft here includes a couple dozen maps, a pile of new and old towers and a new item system that lets you bring in single-use items like landmines and fire-fountains to get you out of bad jams. Many levels are still survival-based, requiring you to keep at least 20 enemies from crossing the screen and reaching your base. Some levels run on quotas, requiring you to beat a set number of enemies; one puzzle level I unlocked challenged me to guide the enemies through special laser gates. I love tower defense games. Desktop Tower Defense and PixelJunk Monsters are my favorites, the former for its ease of play, the latter for its masterful level design and fascinatingly stingy economy. The first Fieldrunners felt too loosely-made for me. Its default level involved 100 waves of enemies, which was about 80 waves of enemies more than I wanted to play during a quick subway ride. I wanted focus. I wanted bites of a challenges, not a meal. Fieldrunners 2, still bulging with 50 and 60-wave levels right at the start and overflowing with content still somehow feels more focused. There is more of a feel of hand-crafted design here and of the developers throwing down challenges for the players to meet. There's even an elaborate batch of card-based achievements to strive for. 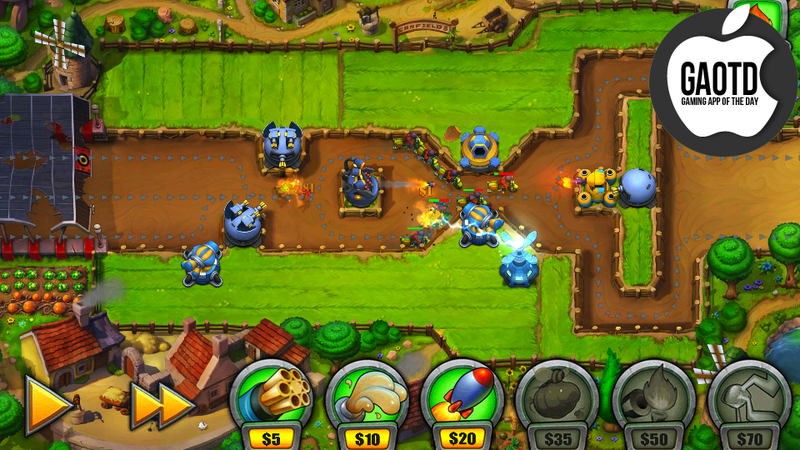 Some Fieldrunners fans may prefer the lighter, less-complex original game. It had, I guess, a Tetris-like purity to its design. I prefer this latter package. I prefer seeing this game's ever-lovely artwork on the scaffolding of a game that seems much more full of varied and interesting challenges. I've just worked my way through the game's first quarter of levels, with two full zones left untouched. I'm going to play a lot more, especially because later levels, the creators say, are full of crazy numbers of enemies. Here's an official screenshot that shows that. Yeah, that looks like fun.